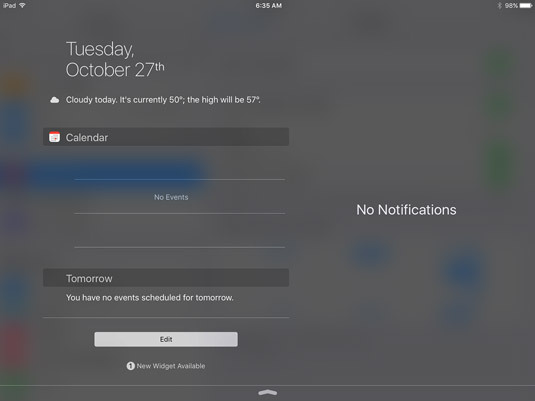 The Notification Center on your iPad is a good place to check on your iPad. After you’ve made settings to specify what should appear in Notification Center, you’ll want to take a look at those alerts and reminders regularly. On any screen, tap at the top and drag down to display Notification Center. Note that items are divided into lists by type depending on what notifications you have at the moment, such as Reminders, Mail, and Calendar. To close Notification Center, tap the bold arrow at the bottom center of the notification area. You can also view Notification Center from the Lock screen. Just swipe down from the top of the screen to reveal it, and swipe up to hide it again. If you hold your iPad in portrait orientation, you get two tabs in Notification Center to play with: Today and Notifications. Tap and swipe down from the top of the screen to display Notification Center. Tap the Today tab to show all Reminders and other items you’ve selected to display in Notification Center (see the previous task) that occur today. Tap the Notifications tab to see items for today plus missed and future items. To change what’s shown on the Today tab, with it displayed tap Edit. Tap a minus button to the left of any item you don’t want displayed. 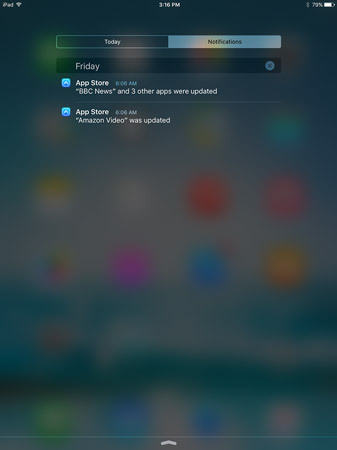 You can easily jump from Notification Center to any app that caused an alert or reminder to appear. Tap the top of the screen and drag down to display Notification Center. Tap any item under a category, such as Reminders or Stocks; it opens in its originating app. If you’ve tapped a message such as an email, you can then reply to the message.